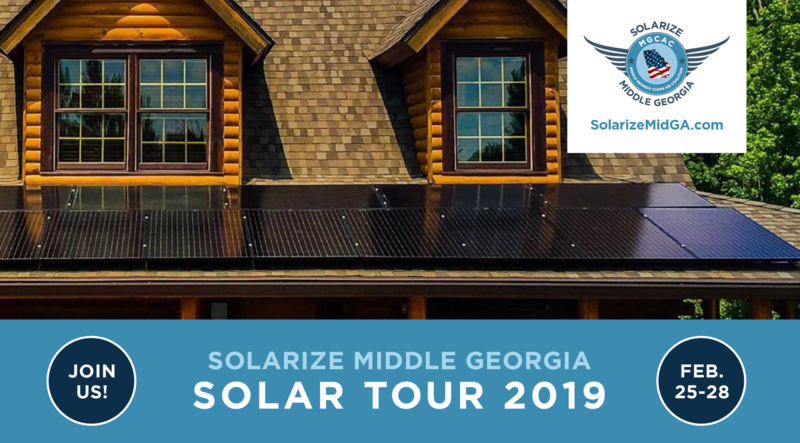 Macon, GA – Solarize Middle Georgia is holding a “Solar Tour,” several workshop and information sessions throughout Middle Georgia beginning on Monday, February 25th. The schedule is detailed in the table below. The Middle Georgia Solar Tour will travel through Baldwin, Macon-Bibb, Houston and Peach counties. The Solar Tour brings awareness to Middle Georgia residents of the new options to power their homes, businesses and nonprofits. Solarize Middle Georgia is a community-wide effort to make solar energy and battery storage more affordable and accessible to homes, businesses, and non-profits throughout Middle Georgia and runs for six months, through April 30, 2019. Solarize Middle Georgia is a community-based initiative designed to educate the public about the benefits of solar energy and battery storage and reduce the cost for everyone. This includes an opportunity for a free, no-obligation solar assessment on your home, business, or non-profit and a way to use clean, renewable energy to increase property values and save on your utility bills for decades. Should a family or business decide to go solar, Solarize Middle Georgia offers bulk-purchasing power to reduce the cost of materials and installation, in addition to the 30% federal tax credit, that will begin to phase out after 2019. The bulk-purchase model offers residents up to 20% savings over those who install outside of the solarize program. Solarize Middle Georgia is the first Solarize campaign in Georgia to span an entire region, including eleven counties, and 31 municipalities surrounding Macon and Warner Robins. Prior campaigns have reached out to one city and/or one city and county. Community partners includes the Middle Georgia Clean Air Coalition (MGCAC), Jones County, Georgia, Environment Georgia, Georgia Interfaith Power and Light, U.S. Green Building Council and Solar Crowdsource. The State of Georgia ranks 10th in the nation for installed solar capacity but most of the energy we use in our homes still comes from coal, gas and nuclear power plants. Community Solarize programs are working to change that. Prior Solarize programs include Tybee Island, Savannah, Athens, Decatur/DeKalb, Dunwoody, Atlanta, Carroll-Carrollton, and Newton-Morgan. Over half of the rooftop solar capacity in Georgia has been generated through Solarize programs. Solarize campaigns are supported by the U. S. Department of Energy. Additional public meetings, workshops and lunch and learn opportunities will be held throughout the campaign. The schedule of meetings and workshops is being developed and will be publicized at the Solarize Middle Georgia website: solarizemidga.com and through social & traditional media channels. Additional partners or “Ambassadors” for Solarize Middle Georgia include Keep Macon-Bibb Beautiful, NewTown Macon, Altamaha Riverkeeper, Redeeming Hope Center, a ministry of Awakening Fires Church (Macon), Georgia House of Representative Patty Bentley (Dist. 139), The Eatonton-Putnam Chamber of Commerce, the Forsyth-Monroe County Chamber of Commerce, the Greater Macon Chamber of Commerce, the Hawkinsville – Pulaski County Chamber of Commerce, The Milledgeville-Baldwin County Chamber of Commerce, Perry Area Chamber of Commerce, Roberta- Crawford County Chamber of Commerce and Twiggs County Development Authority and the Twiggs County Chamber of Commerce.